Flowers and Spices: Ayurveda or Toxic Chemotherapy? Ayurvedic medicine uses foods, spices, flowers, and other remedies found in nature to both prevent and heal. Compared with Western medicine, which has a virtual monopoly on deciding what is "scientific" and what is not, the ancient healing art of the Indian subcontinent is undervalued although according to the World Health Organization, 65% of the population in rural areas in India use Ayurveda and medicinal plants to help meet their primary health care needs. Ayurveda certainly is more gentle in its approach to health and illness than the chemical pharmaceutical paradigm of the West. The question is - is it also more effective - are natural biomolecules as used in traditional medicine preferable to our often toxic chemical drugs? Ayurveda is the Vedic system of health care that developed in India over 5000 years ago and this ancient science is about restoring health and healthy functioning of the body and there are formulations that address certain disease conditions. One such formulation involves spices and coconut oil and petals of a flower for diabetic patients and that basic formula can be altered to treat cancer patients or diabetics with cancer etc. I have noted even cobra snake bites being treated with plant "juices" in North India and it is entirely possible to think of a herbal antivenom. Ayurveda is a life science of a past civilization and it is practiced even today. Ayur means life or life-giving and veda means knowledge. It embodies the phyto-pharmaceutical knowledge of ancient India that attempts to treat patients with plants (natural biomolecules) and bioavailable minerals. It is life-giving because it aims to restore the biochemical pathways in the human body in accordance with its natural or cellular biochemistry in contrast with drugs as used in allopathic medicine. Ayurveda does not treat people or disease conditions with drugs but there are instances of the use of mildly toxic natural biomolecules that occur naturally in combination with natural antioxidants that are applied by some ayurvedic doctors in treating diarrhoea or food poisoning and infections in village areas. Dr. Rebecca Liu from the University of Michigan is reported to have shown that ginger can kill ovarian cancer cells (NST, Thursday 6 April, 2006, p36; Using spices to fight cancer) and such reports become news in the global media as a thing in the celebration of life but it is nothing new to the experienced ayurvedic doctor or researcher. Ayurvedic doctors have been using spices and certain flowers and other plant extracts for restoring health as well as treating disease conditions. Ginger is commonly used in India for a host of medical problems. Sometimes it is used in combination with black pepper and honey for swellings or for treating a persistent cough. Citrus fruits, too are important in certain ayurveda formulations, not to mention onions which provide the citrate and ascorbate radicals. Modern science is only rediscovering ayurvedic knowledge. Scientists have researched the anti-cancer properties of black pepper, a spice grown in Malaysia as a cash crop. Several studies and research at the Forest Research Institute, our scientists have shown the LDL-lowering ("bad cholesterol-lowering) property and anti-inflammatory properties of black pepper. There are other studies that show the role of cinnamon in improving glucose metabolism and show that medium chain fatty acids in coconut oil are not converted into lipoproteins (unlike vegetable oils and hydrogenated oils) but instead they are broken down in the liver to produce energy. Hence, coconut oil as a formulation with cinnamon, a spice, improves glucose metabolism and provides energy from a non-glucose source. Long chain fatty acids from vegetable oils and hydrogenated oils are converted in the body into lipoproteins. Lipoproteins circulate in the blood stream and these molecules can participate in plaque formation and clog the arteries or contribute to heart disease. Spices, like natural vitamin C are edible substances and are in fact food for our bodies. They are not toxic to our cells but promote the life-giving biochemistry in healthy tissues and cells unlike drugs that may be disruptive to cellular biochemistry or disruptive to the biochemical pathways and they are not harmful to the symbiotic ("good") bacteria in our large intestines. Their mechanism of action againsts pathogens and cancer cells lies in their biochemical breakdown in the pathogen or cancer cells to induce the production of hydrogen peroxide that kills these cells, a process referred to as apoptosis or cell death. 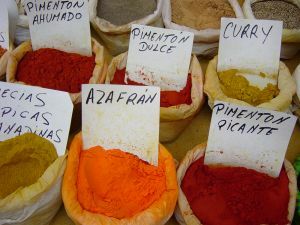 Natural biomolecules in spices also disrupt the (oxygen transferring and hydrogen transferring) enzymes required in the anaerobic respiration that keeps the cancer cells alive just as carcinogens impair aerobic respiration in normal cells directly or indirectly through excess free radicals especially the hydroxyl radicals. People in Sri Lanka consume the largest amount of turmeric in their daily diet and they have the lowest incidence of cancers. Many ayurvedic doctors know the cancer-inhibiting and tumour inhibiting properties of turmeric and some use it as part of the approach to prevent the spread of cancers in the body of the cancer patient while using other phyto-chemicals and spices to shrink tumours or destroy cancer cells and improve function of the immune system with antioxidants and minerals. We now know that increasing the number of T4 cells helps fight cancers. Some studies show a link between chronic mineral deficiencies and cancers. Such an association may be biologically linked through disruption in the Krebs cycle and the electron transport system in cells and eventually producing a cellular environment of low oxygen and low aerobic energy which is conducive to cancer cell formation as it makes the switch to anaerobic respiration that uses the sugar-fermentation-alcohol process to generate energy. Paradoxically, chemotherapy also depletes several minerals in the body and its own toxicity is now being linked to cancer formation and a warning has been issued to health workers who handle these drugs. Also, oxidative stress initiated by chemotherapy can exert oxidative stress on the insulin receptors in cells and/or cause free radical damage to insulin molecules and in both cases, the insulin molecule cannot dock onto its receptors - a situation that can result in low aerobic energy in cells. Using spices to fight cancer or to promote normal metabolism of glucose is part of ayurvedic knowledge and I am therefore confounded why when scientists rediscover this through research in their labs, it is hailed as a major breakthrough knowledge. Ironically, as recently as 20 years ago, scientists scoffed and laughed at ayurveda and the use of spices in therapy. They went on to test one toxic drug after another as a chemo-agent to treat cancer patients and one wonders if the cancer patient eventually dies of cancer or from the effects of chemo-toxicity. Chemo-toxicity could very well finally produce sufficient free radicals in the breathing centres in the brain to produce breathing difficulties and suppress the immune systen at the same time. Today, many of these very same proponents of chemotherapy now claim that cancer cells are becoming resistant to standard chemotherapy. In evolutionary biology, there are no life forms that so rapidly evolved to become resistant to toxic chemicals and there is no known adaptation to chemicals as toxic as the chemo-drugs. Life forms in toxic environments took millions of years to evolve and adapt their biochemistry in order to thrive in it. Hence, it is doubted that cancer cells managed to evolve rapidly within two decades to become resistant to chemo-drugs. The basic biochemistry of cancer cells is the same as talked about in 1966 and the basic cytotoxic mechanism of chemo-drugs remains the same. What needs to be reviewed and re-examined is the original claims on the efficacy of chemo-drugs to determine if those were true. In the mean time ayurvedic knowledge must expand as a modern science especially in its knowledge of how natural biomolecules improve cellular function and how some of these disrupt energy pathways in cancer cells. It is already supported by information on free radicals and the role of antioxidants in cellular biochemistry. It is a safe therapeutic approach but it must find ways to collect better extracts that could also be used intravenously and contribute to the science of perfect aerobic embryonic metabolism that enables the liver to regenerate rapidly so that it could be used as therapy in heart patients and trauma patients as well as in patients with major problems in other organs. That would be indeed something to celebrate. Decline of Allopathic Medicine: Will Cellular Health, Ayurveda Form New Paradigm? Cancer And Micronutrients: A Connection Worth Exploring? The Future Of Medicine - Integrated Or Cellular? I am presently in Chemotherapy for Ovarian Cancer. I have practiced Ayurveda Medicine/Spices for almost 5 years.. I daily consume these spices in pill form. Turmeric, Holy Basil, Fo Ti, Ginger, Milk Thistle, Cinnamon, Lethicin, Bee Propolis, Astragalus, Cardamom, Garlic. I also drink 6-8 cups of Chinese Green Tea daily. The tea is just since my Chemo. I truly beleive that because of my regiment, I have suffered no ill side effects of Chemotherapy, and I feel wonderful during this period in my life. Thank you for taking the time to read my note. Green tea contains powerful antioxidants called catechin polyphenols that are responsible for many of the health benefits of green tea.